What do you say about best-of releases? For more than two decades, Black has been plying Northeast Ohio with some seriously good bluesy rock music, in the vein of J. J. Cale--low key, low voice, swampy, slightly menacing, and very satisfying. I have enjoyed several of his albums, especially Black Ice and Shades of Black, but haven’t heard them all. This latest release collects some tracks from many of his previous dozen or so albums (none from his covers album, The Big Cover Up, released in 2011). All the songs are his own, and it’s on his own music where he shines brightest. 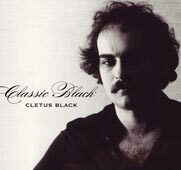 Black subtitles this CD The Best of Cletus Black on his website, but that doesn’t show up anywhere on the booklet or CD. But these 19 tracks are certainly a fine sample of his best work. He’s chosen at least one song from most of his albums, but relies heavily on One More Card to Play and Black Ice, with three each, with one or two from the others. He even pulls two tunes from his earlier compilation of 1980s material, Shades of Black. I can sense a change in his voice over the years (we all change), and more recently he has had a lighter touch, although he’s still strong. His guitar hasn’t changed, and still provides a fine accompaniment. Black names a boatload of accompanying musicians who have worked with him over the years, including the members of his current band, the Cletus Black Revue. This album was remixed by Dave Morrison, the harmonic player in the Revue, who’s worked with Doc Dreyfuss, and Aces & Eights. The songs range from a couple of rave-ups ("Night Train" for example), to a couple of ballads, but most fall somewhere in-between, sort of a mid-tempo shuffle. Some are a bit more rockabilly in style, with occasional touches of swamp rock, and even New Orleans. There’s not a clinker in the batch, and I tend to think of this as music to drive down the road with. A couple of the songs are alternate versions or mixes, and one tune, “Depot Road,” was never released until now. If you want to get a full taste of this fine musician, this CD is a great place to start. Personnel: Cletus Black (vocals, guitar), and about 35 other people on various tracks. Tracks: Baby Hi, Don’t Push the River, BYO Blues, He’s Got a Harley, Cocaine Trail, Depot Road, No Moon Night, Shuffle that Deck, It’s Hard to Rock, Hold on Tight, I’m Ready, Woman Woman, Ocean Drive, Graveyard Shift, Clothesline Blues, Tennessee Baby, Creole Witch, Night Train, Throwing Aces. We often add older Northeast Ohio music to the library's collection, because: A. The stuff is useful and/or good; or B. We got it cheap. Either way, we're building our back file, and here's a list of items we have placed in the collection. If you have access to an OhioLINK library you can even borrow them. We hope you find this useful and entertaining. Captain Kneel & the Noisemakers. Captain Kneel & the Noisemakers. Roger Hoover & the Whiskeyhounds. Golden Gloves. Ringworm. The Venomous Grand Design. Skychief. Me Rock You So Hard. This Moment in Black History. It Takes a Nation of Assholes to Hold Us Back. David Thomas & Two Pale Boys. Erewhon. Oliver Buck. Rust Belt Blues. Robert Lockwood Jr. I Got to Find Me a Woman. Hal Walker. Home in Ohio. James Emery Septet. Spectral Domains. Cleveland Orchestra (Jahja Ling, conducting). Also Sprach Zarathustra. Cleveland Orchestra (Franz Welser-Möst, conducting). A Night in Vienna. Quire Cleveland. Carols for Quire from the Old & New Worlds. Michael Sachs/Todd Wilson. Live from Severance Hall. We would love to review your CDs. The best way to have that happen is to send us a copy. Please direct all mailings to Jeff Wanser, Hiram College Library, 11694 Hayden St., Hiram, OH 44234. Want to listen to Northeast Ohio Music on Spotify? We’ve created a bunch of playlists. Just type in NEO Music, and you should see playlists for rock, classical, jazz, R&B, metal, and polka! 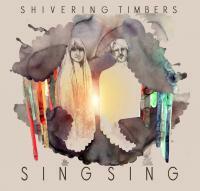 Shivering Timbers’ first full album, Sing Sing, is a strange mixture of genres blended together with a heavy stock of indie rock. This what I’d consider more of a folk band than anything else and Sing Sing’s title track has an indie pop quality to it. Sarah and Jayson Benn have a good collaboration and the songs are both melodic and chaotic. While many people in the music world suggest avoiding relationships in the band, lest you end up writing the overplayed “Don’t Speak” or anything from the oeuvre of Captain and Tennille, but often the married couple thing works. In this case, I don’t think the fact that Shivering Timbers happens to be a married couple detracts at all, and I hope they are enjoying or not enjoying the groupies accordingly to their previously agreed upon arrangement that may or may not exist. And I’m sure they’ll appreciate that. “Holly Holy” (a cover of the Neil Diamond tune) is a slower track, a little boring at the beginning, but the song shows power in the vocals which can fall behind in many indie tracks. It’s easy for a female artist to have her range pushed to the back burner in favor of “haunting” qualities, especially in Indie Rock (is anyone else as tired of Zooey Deschenal as I am?) It has a neat sixties folk sound to it with heavy drumbeats., sort of a Joan Baez/Grace Slick sensation. Less indie and more electric folky, “Generations” is a great tune lyrically and melodically. The echoing of the vocals works with the rawness of the electric guitar. Grungy bass layers nicely and the band sounds united. 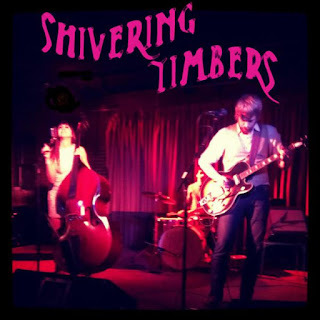 Shivering Timbers has the intimacy on the Weepies (married couple and band mates), albeit with a harsher, howl to it like good old country songs. There is something so earnest about the sound that I didn’t roll my eyes once, which is pretty much my go-to reaction. I was really hoping for something from the song “D.H. Lawrence,” being a literature nerd, but it blended into the song before it so the place in the album didn’t make it stand out. Actually I didn’t realize it was a different song until it was almost halfway over, which is never good. Cold Mountain and the Civil War can be heard in the bluesy country tracks like “Satan Your Kingdom Must Come Down” and the cover of “Wayfaring Stranger” (which is right up there with “Hallelujah” when it comes to overly-covered songs). While this isn’t my favorite rendition of “Wayfaring Stranger,” I think it would have been better without the ornamentation, it’s still solid. It was brave to remix the tempo and bit, modernizes it, which is more of a change than most artists would bother to attempt. All Our Days is very She and Him which I find particularly irritating since I hate them and the entire concept of “Adorkable” is ridiculous to me. However, this is the trend of Indie Rock these days and I’m willing to forgive Shivering Timbers for this since so much of their stuff has a bluesy layer to it. Overall, Sing Sing is a good, full bodied piece of work and Shivering Timbers have a creative and cool sound that has enough country to it to make it stand out among the “indie” wave. Tracks: Sing Sing, Holly Holy, Generations, Without Someone, D.H. Lawrence, Annalee, Satan, Your Kingdom Must Come Down, Wayfaring Stranger, All Our Days, Big Fire, I Love You So Much, The Mopping Floor, Boys and Girls. 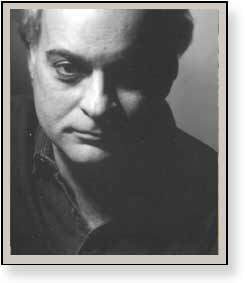 Dan Miraldi. Sugar & Adrenaline. 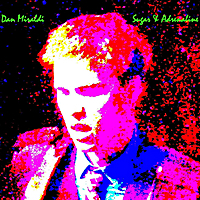 In a world of post-rock, electronica, and plastic top 40, Dan Miraldi is a throwback. He combines a variety of retro styles and influences ranging from Americana to punk, glam to garage, but never sounds out of date. One can place him roughly in the power pop category, next to a lot of Cleveland bands, including the Raspberries, although the direct similarities to them end there. Miraldi has boy-band good looks, a solid, and at times fiery guitar, and an expressive, clear tenor voice that is amazingly good. While the press seems to compare his sound to the Rolling Stones and the White Stripes, he and his band remind me more of David Bowie, Steve Miller, Buddy Holly, the Standells, and even the Monkees, depending on the mood of the song. This is his second full-length album, and third overall. In comparing it to his first, Thirsty, from 2009, it’s clear that he has matured in his arrangements, and his music is more complex, bringing in a wider array of instrumentation and mood. His voice is his strength, and I really enjoy his direct, articulate singing style (I didn’t need a lyric sheet) which hasn’t changed a bit since the first album. Miraldi also harmonizes nicely with his bandmates on vocals. He still rocks hard, but mixes the uptempo burners with mid-tempo tunes and the occasional ballad, lending a greater variety to the whole package. Most songs are short and sweet, with a tightness that is quite amazing. Miraldi isn’t much for hanging around or taking extended solos (although it might be nice if he did a bit more on the guitar). Endings tend to be abrupt and he never fades out. The rhythm section is solid and keeps the band moving forward, but never takes the foreground, with nary a drum solo to be heard (again, something to consider for the future). 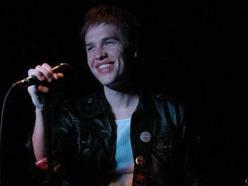 The opener, “Few Rock Harder,” sets the mood of the album with a driving beat and strong hooks. “The Runaround” is the track that reminds me of an old Steve Miller song because of its punctuating riffs, and slightly off-kilter tempo. The track that is getting pushed for airplay (and the shortest song), “Road Warrior,” is another fast-tempo tune, with traces of Green Day as done by the Allman Brothers. “Yonder St. Sebastian” gives us Byrds-like folk-rock vocals, but the next tune, “Vampire Girl,” takes us in a more Tom Petty direction. “She Got Soul Part I” is in a similar vein, with Neil Diamond instantly springing to mind, and “Revenge” recalls David Bowie. For empirical verification of my perceptions I called out the artists I thought of to my wife as the tracks came up. She usually responded, “Hey, yeah!” or something similar. Proof. Miraldi needs to break out of the love song rut. A couple of songs about something else (life on the road, The closest he comes is “Record Collection,” a story of his disillusion with his girlfriend’s pretentiousness and phony friends, that takes him home to his record collection, presumably a vinyl one. His ballads are still a bit shaky, not melodically or in structure, but in the lyrical content, where he tends to try for worldliness (“Helen of Troy”), and ends up sounding like a college kid writing a song based on his last class. Frankly, he sounds more sophisticated when he goes for an innocent approach, since it lends an air of honesty that can be interpreted as depth. The title of the album is entirely accurate, with a combination of sweetness and speed that is quite infectious. It's fun, filled with catchy hooks, and the band performs beautifully. Dan Miraldi has some serious talent, and as he develops, I cannot imagine him not reaching a wider audience. Give the guy a try. Personnel: Dan Miraldi (vocals, guitars, keys, organ, percussion, bass), Joe LaGuardia (bass), Sarah Luffred (drums, backing vocals), Alex Bowers (guitars, organ). Tracks: Few Rock Harder, The Runaround, Now is the Right Time, Road Warrior, Yonder St. Sebastian, Vampire Girl, Record Collection, Helen of Troy, I Fall in Love All Over Again, She Got Soul Part I, Revenge, The Many Shades of Blue.